. Published on October 2, 2017 . The word communication literally means “to make common.” At its most basic level, it means letting your needs be known. At its highest level, communication means building strong, trusting relationships with people whose perspectives are very different from your own. The educator and psychotherapist Virginia Satir wrote, “Once a human being has arrived on this earth, communication is the largest single factor determining what kinds of relationships he makes with others and what happens to him in the world.” It also determines whether you are capable of being a highly effective leader. Much of my work in developing leaders and leading organizations focuses on communication. Since publishing Straight Talk® in 1998, I’ve continued to develop my understanding that people can develop four different levels – or “powers” – of communication. Here’s a description of these four powers. From the moment we pop out of the womb, we start expressing what we want. We communicate we are hungry, or sad, or happy. Over time, we learn how to use words. We learn how to name simple emotional and mental states. By the time we’re adults, we’ve developed a full array of strategies to express how we feel and what we want. Yet even as adults, we are still working on this first power. Adults, rather than getting straight to the heart of what they want, often beat around the bush, deflecting attention from the real issue or need out of the fear of losing “face” – a fear of exposure, a fear they will look silly, a fear they will lose authority or power. Yet learning how to express ourselves even when it feels emotionally charged and sensitive is all part of mastering the first power. 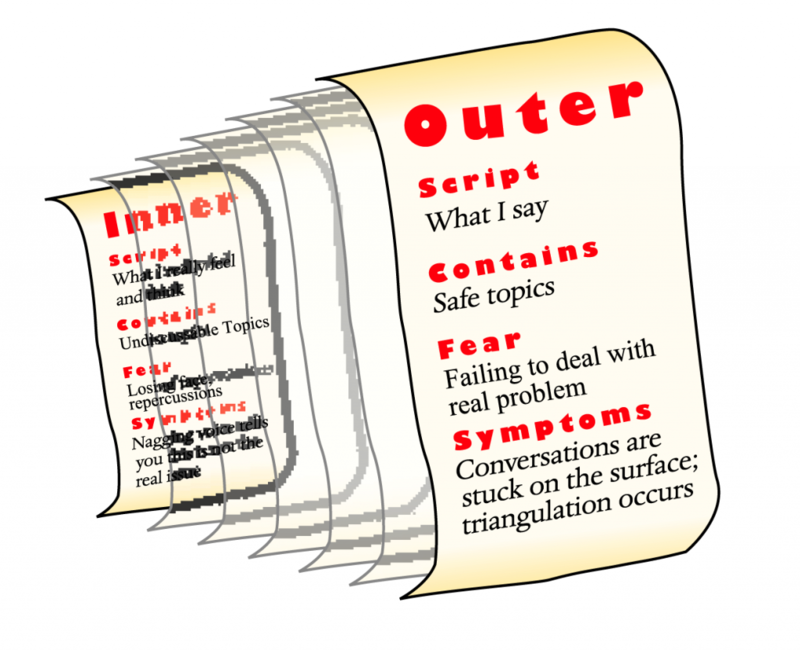 The trick is to learn how to express our “inner scripts” – the things that might embarrass us if we express them – in a way that shows we are genuinely conflicted about them. Soon after we pop out of the womb, we also begin learning how to respond to others. We laugh at funny faces. We sense other people’s moods. As we gain the use of language, we respond with words. By the time most of us reach age five or six, we can share our thoughts and feelings with another person and build fledgling relationships. As we grow older, we learn how to participate in a conversation, recognizing that the other person deserves our respect and attention. We begin to establish patterns of speaking and listening based on the notion of reciprocity and trust building. At a more advanced level, people who master this second power can extract a deeper meaning from a conversation than simply what is said. They can paraphrase what they’ve heard. They can interpret what someone means and add layers of meaning to it. They can validate their interpretation and, by so doing, create deeper bonds of trust with other people. Level 1: Volition. Is my attention voluntary or involuntary? Level 2: Consciousness. Am I in a highly conscious state or a routine state? Level 3: Affinity. Am I attracted to or repelled by the communication? Level 4: Quality. Is my attention creative, analytical, or empathetic? Am I varying it based on the situation? Regulating the levels of attention and intent enables third-power communicators to show a high level of emotional intelligence. Daniel Goleman, who popularized the term “emotional intelligence,” has shown that the most successful leaders display emotional intelligence competencies like self-awareness, self-regulation, motivation, empathy, and social skill and are therefore able to build deeper and more satisfying relationships. If you can answer yes to these questions most of the time, then it’s a good sign you’ve mastered the third power of communication. People with the fourth power can take their communication one step further: they can vary their communication based on an accurate understanding of the other person’s communication style and the assumptions that underlie that style. They have the self-awareness to identify the other person’s frame of reference and adapt their own style accordingly—and thus help facilitate productive communication among people with different and often conflicting points of view. To master the fourth power, you have to recognize that even when people are speaking the same language, they may be talking and listening past each other within different frames of reference and operating assumptions. You have to learn how to identify these different styles, and then learn how to vary your communication style depending on the situation. 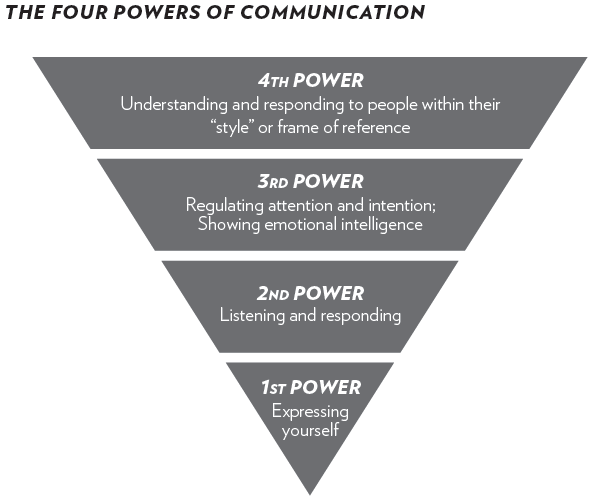 The fourth power means knowing how to foster better communication by varying your style. Director: Directors are hard-charging, action-oriented leaders, focused on results. The director’s style of communicating is assertive and task-oriented. Directors operate on the assumption that quick action and decisiveness are valued, and that people are rewarded for getting things done, the sooner the better. Directors frame the world as a competitive place of action and decisiveness. Expresser: Expressers focus on leading through their creative ideas. The expresser’s style of communicating is assertive and people-oriented. Their operating assumption is that people should feel free to voice their opinions, think outside of the box, and articulate what they feel. They like to entertain. Expressers frame the world as a place where people are recognized for their personal creativity and achievement. Thinker: Thinkers are detail-oriented leaders and focused on what it takes to get the job done right. The thinker’s communication style is less assertive than the Director and Expresser. Like Directors, Thinkers are also task-oriented; they assume that there’s a best way to do things – and it’s their job to make sure no mistakes are made. They feel rewarded when a task or project is done well. They frame the world as a place in which to solve problems and get things done. Harmonizer: Harmonizers lead by supporting others. Their communication style is also less assertive than the Director and Expresser. Like Expressers, Harmonizers are people-oriented. They operate on the assumption that they need to look after the needs of the team and other people’s welfare. They feel rewarded when the team performs well. They frame the world as a place where relationships with people are the most important aspect of their lives and prefer to work collaboratively. The fourth power encompasses the highest level of self-awareness. Because they are conscious of people’s styles, people with this power can use that awareness to shape how they listen. This is truly powerful listening. As they listen, they are able to apply the matrix of communication styles. They can quickly identify the underlying frame of reference and respond in that frame. For the person being listened to, it’s an amazing experience. “I feel truly understood by her when I’m talking with her,” is how one person describes it. The difference can be gauged by the reaction you elicit. When you engage in the fourth power, you elicit honest, heartfelt trust. People share their most sensitive stuff. People feel that you truly value their point of view. One of the most effective fourth power communicators I’ve met is one of the former deans at Harvard Business School. When talking to a Thinker, she could be very detailed and analytical. When talking to an Expresser, she would animatedly tell stories and joke around. When talking to a Director, she would cut right to the chase, and the discussion would be over in five minutes. And when talking to a Harmonizer, she would begin with some small talk before introducing the real topic of discussion. What’s important about the fourth power is that it can be learned. It begins by learning your own style. You then need to learn how to decipher other people’s styles. Check out our blog that explores these topics at CommunicationStyles.org. Subscribe to the LRI newsletter to receive a PDF of this post.